The keel was laid for the"Golden Grizzly" on January 23, 1970 at the Newport News Shipbuilding and Drydock Company, Newport News, Va. She was launched on September 22, 1971 with a "near miss" of the champagne bottle by First Lady Mrs. Richard M. Nixon. The USS CALIFORNIA was commissioned on February 16, 1974 at Pier 12 of the Norfolk Naval Station, Norfolk, Va.
For ten years, USS CALIFORNIA, the sixth ship to bear the name, steamed the Atlantic and Indian Oceans as well as the Mediterranean Sea from this homeport, serving three times with the Sixth Fleet and twice with the Seventh Fleet. Her first Mediterranean Cruise was from July 1976 to February 1977. 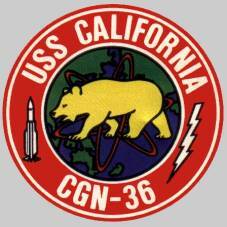 In the summer of 1977, CALIFORNIA represented the United States Surface Fleet at the Silver Jubilee Review in Portsmouth, England. More than 150 warships from 18 nations participated in this commemoration of the 25th anniversary of Queen Elizabeth's coronation. Two years later, reactionary Moslems intensified their revolt against the Shah of Iran. Following seizure of the U. S. Embassy in Iran, CALIFORNIA, along with USS NIMITZ (CVN 68) and USS TEXAS (CGN 39), interrupted a routine Mediterranean cruise to steam from Livorno, Italy, to the southern coast of Iran in the North Arabian Sea. The all-nuclear task group completed the 12,000-mile transit in only eighteen days, remained on station in the Indian Ocean for the next five months, and eventually returned to Norfolk from the 80,000-mile, nine-month deployment in May of 1980. The following year, CALIFORNIA completed its second Indian Ocean cruise. 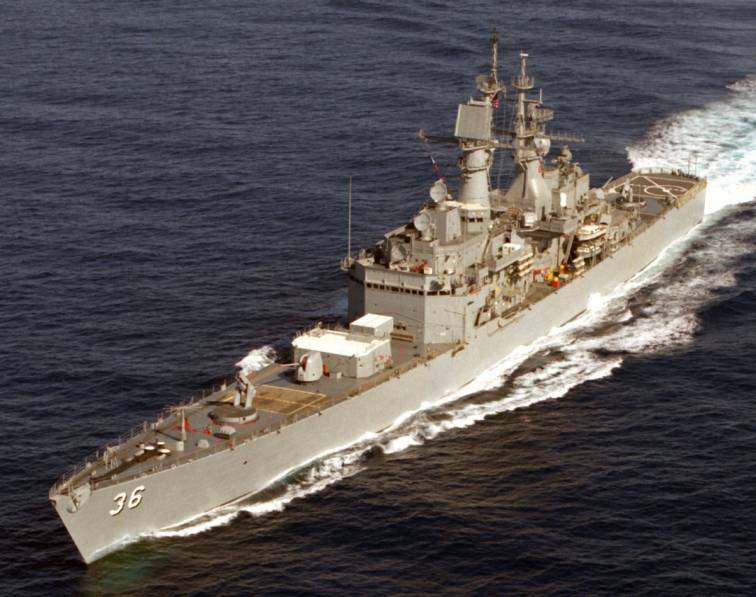 Upon returning to Norfolk via the Panama Canal, the cruiser became the first nuclear-powered surface ship to circumnavigate the globe since the USS ENTERPRISE (CVN 65) task force completed Operation Sea Orbit in 1964. In September 1983, the "Golden Grizzly" left Norfolk for the last time, steaming through the Panama Canal to its new homeport, Naval Air Station, Alameda, California. The ship embarked on its first Western Pacific and Indian Ocean cruise in February 1985 as a member of the USS CONSTELLATION (CV 64) battle group. 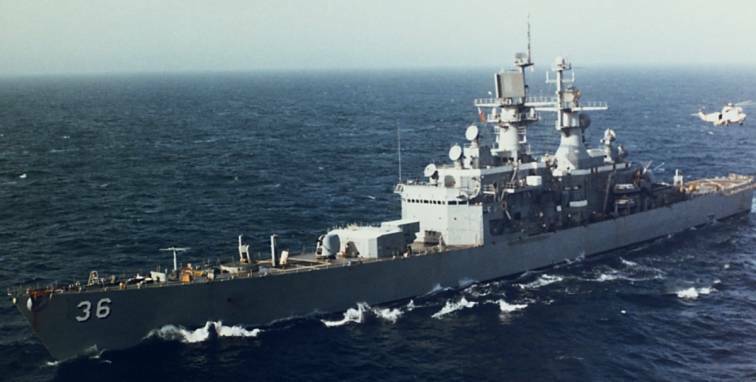 During the spring of 1986, CALIFORNIA conducted several weeks of Bering Sea operations and became the first cruiser to visit Adak, Alaska, since World War II. She again deployed to the Western Pacific and completed a second "Around-the-World" cruise in 1987. The year 1988 brought continued high-tempo operations as CALIFORNIA cruised the Western Pacific and Indian Oceans for a third time. The ship served as battle group Anti-Surface Warfare Commander during the RIMPAC 88 exercise as well as for Olympic Presence Operations off the Korean Peninsula. Subsequently, during her 1988-1989 deployment, CALIFORNIA assumed duties as Anti-Air Warfare Commander for operations in the North Arabian Sea and Arabian Gulf. While assigned patrol duties in the Strait of Hormuz in December 1988, CALIFORNIA conducted the last USN EARNEST WILL convoy mission through the strait. 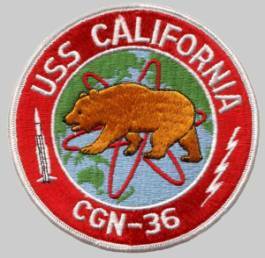 The summer of 1989 saw CALIFORNIA tasked with Northern Pacific operations as part of a CNO project to study the effects of Near-Land Operating Areas on carrier battle group operations. 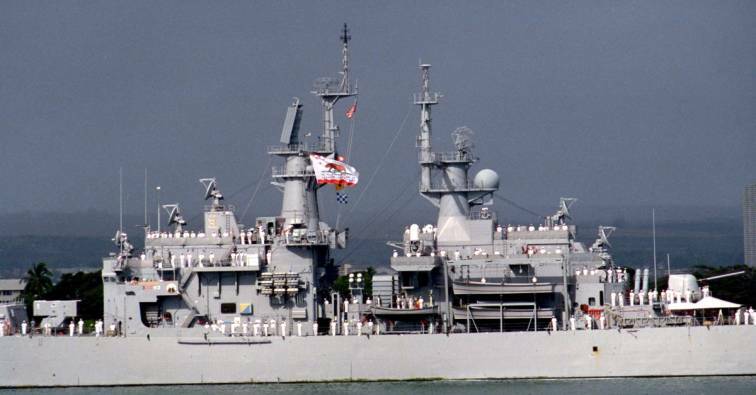 In September and October of 1989, the "Golden Grizzly" participated as an anti-air-warfare picket ship in PACEX 89, the largest combined sailing of U. S. and allied naval units since World War II. In April 1990, CALIFORNIA entered the Puget Sound Naval Shipyard in Bremerton, Washington for a three-year refueling complex overhaul, including two new D2G high endurance reactor cores in her engineering plant with adequate fuel capacity to power the ship for more than 20 years of normal operations, and the New Treat Upgrade Combat Systems Suite. Upon completion of the overhaul in January 1993, CALIFORNIA began a series of exercises and evaluations in preparation for deployment. These included independent training in all aspects of its mission as well as coordinated battle group exercises. In June 1994, CALIFORNIA joined the USS KITTY HAWK (CV 63) battle group in the Western Pacific for the ship's first deployment in five years. CALIFORNIA exchanged personnel with the Republic of Korea Navy for a combined exercise and with the Japanese Maritime Self Defense Force for ANNUALEX 06G and KEEN EDGE 95. The cruiser also took part in a LINKEX exercise with United States forces in and near Korea, establishing the most extensive tactical data link ever in this region. The deployment wrapped up with participation in TANDEM THRUST 95, a joint exercise with the armed forces of the United States, Australia, and several allied nations. 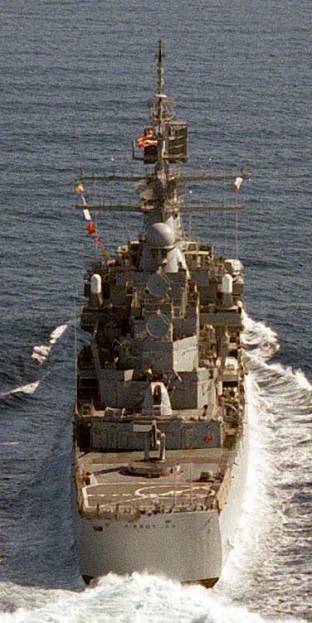 CALIFORNIA then returned to her home at the Puget Sound Naval Shipyard just before Christmas 1994. 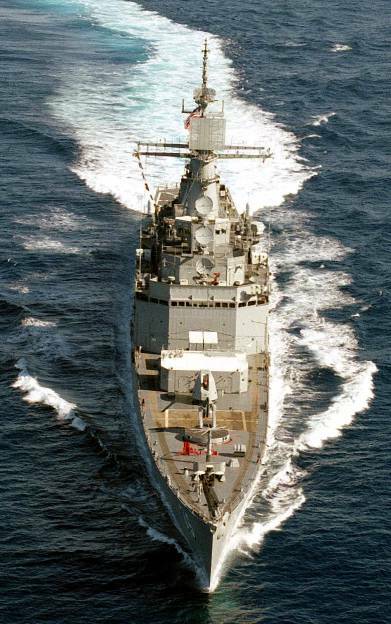 In 1995, CALIFORNIA completed a four-month maintenance availability, improving the reliability of her propulsion plant and updating her combat systems. In September 1995, the "Golden Brizzly" sailed in a parade of ships through Pearl Harbor as part of the ceremony commemorating the end of World War II. 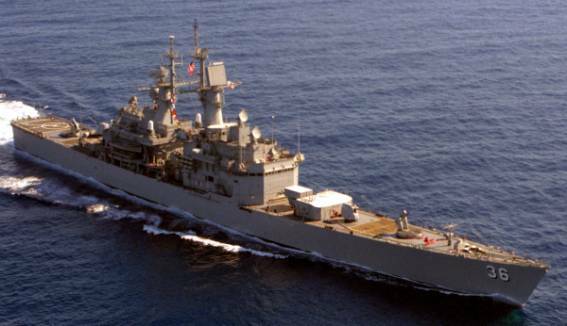 In May 1996, CALIFORNIA left for the Western Pacific and Indian Oceans and the Arabian Gulf on a routine six-month deployment with the USS CARL VINSON Battle Group. CALIFORNIA received the Meritorious Unit Commendation for operations SOUTHERN WATCH and DESERT STRIKE for shared duties as Air Warfare Commander for the Carl Vinson Battle Group. In January 1998, CALIFORNIA deployed to the Eastern Pacific and the Caribbean Sea in support of Counterdrug Operations as the Air Warfare Commander for the Joint Inter-Agency Task Force (JIATF) East. In July, she gave her last "GRIZZLY ROAR" by participating in RIMPAC 98 as a member of the Bilateral force. 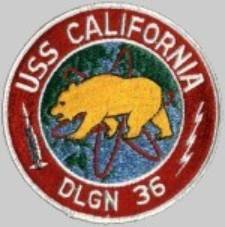 The USS CALIFORNIA Deactivation Ceremony was held on 28 August 1998 at the Puget Sound Naval Shipyard in Bremerton, Washington.